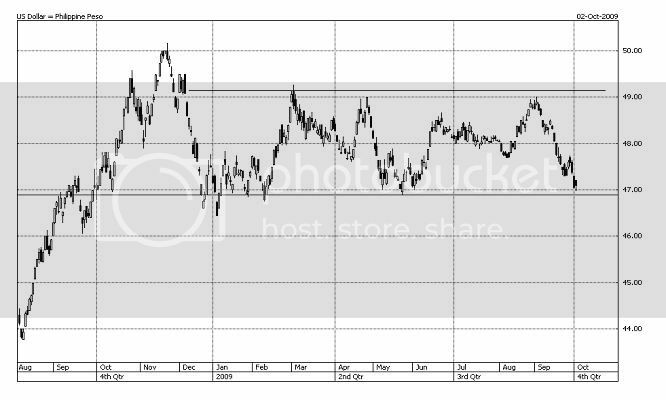 · Peso strengthened further, hitting a fresh 9-month high of P46.71 to a dollar vs P47.10 the previous day. · Philippine central bank reportedly bought around $200 million at several levels, with bulk at 46.72 mark. This is bad news for us dollar earners. Do you think this is just a temporary thing? Thanks. In addition to OFW’s remittances the unemployment rate of US has reached almost the double digit mark (9+%)this month might have contributed to peso’s strength? Or it is because of the oil has rose back again? Remember last year that the dollar took a plunge down to P39 then the oil soars up to $145/barrel. I hope this is not what is happenning. Having stronger peso at this time helps in stabilizing prices at a difficult time. However it’s also bad for dollar earners and OCWs. As long as the rate wouldn’t fluctuate as much and stabilizes at the current rate, I think the result will acceptable.